It’s like we were just here! We are back in Florida…..It’s like we were just here! We had anchored and staged for the crossing at Great Sail Cay. 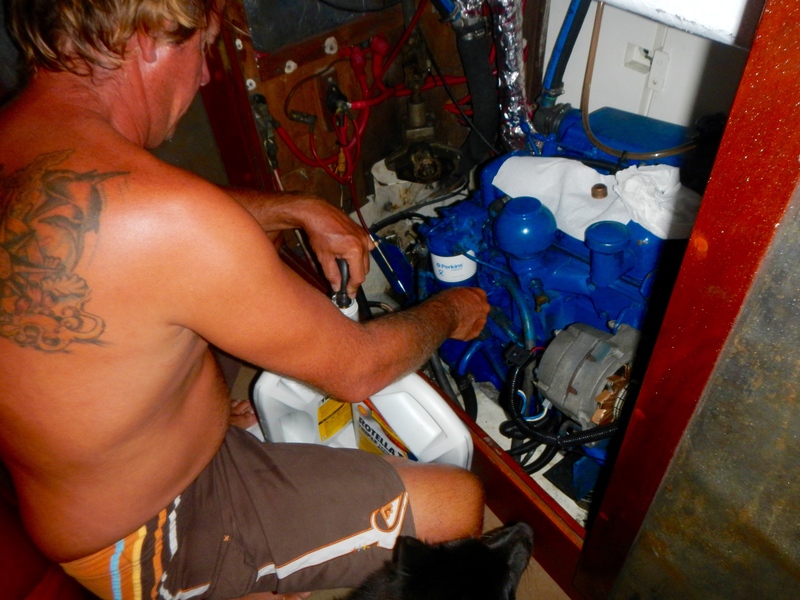 Keith did all the maintenance and gave all systems a good inspection and we stowed everything away. 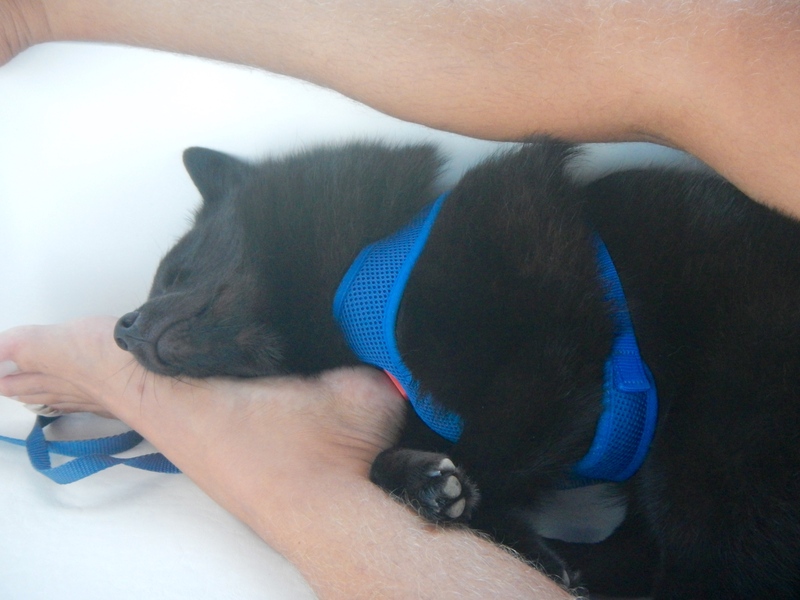 Other than that, we relaxed most of the day and at 5pm raised anchor and began our treck back to Florida. The forecast was for SE to SW winds 8-15 and seas 2-3 and very little chance of squalls. Sweet sailing! 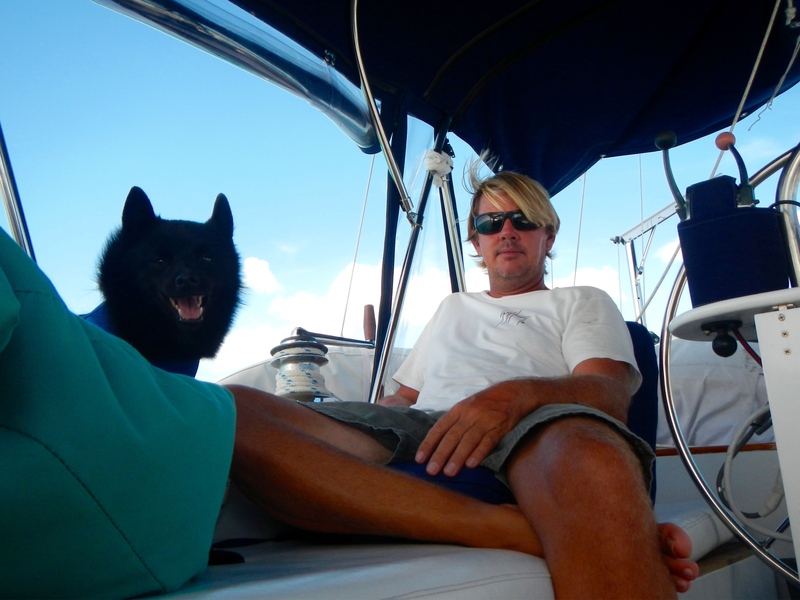 The Little Bahama Bank was choppy but we had good sailing winds and made good time, even the currents were in our favor. We hit one squall, but reefed before we got to it and all was short lived and uneventful. We had already sailed off the Bank and I went below for a nap around 5am thinking we would be in Fort Pierce just after lunch with these speeds. When I woke up around 7am, the wind was from WSW and dying, shortly after it was out of NW (right on the nose) and barely detectable. The seas were ice-rink smooth and we settled in for a slow easy motor across the stream. Wasn’t the forecast, but no complaints! 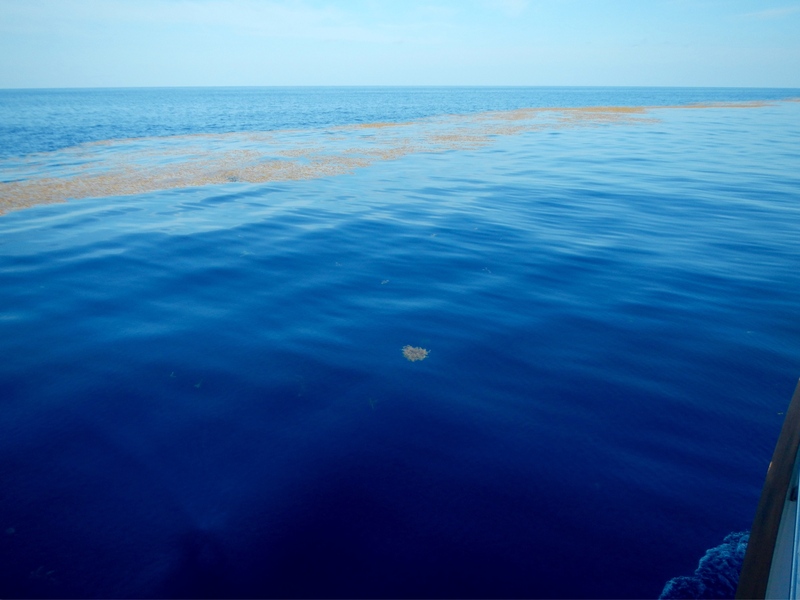 The Gulf Stream was calmer than any of the anchorages we’ve had for the past two weeks! We ran across two long weedlines and took the time to troll along them for a few miles, we could see a few small fish but we didn’t catch anything. Kai was more than happy to have a lap to sleep in for the whole way. Other than being a great snuggle-buddy his watch-keeping skills while under way are worthless, we even had a little hitchhiker sneak aboard. 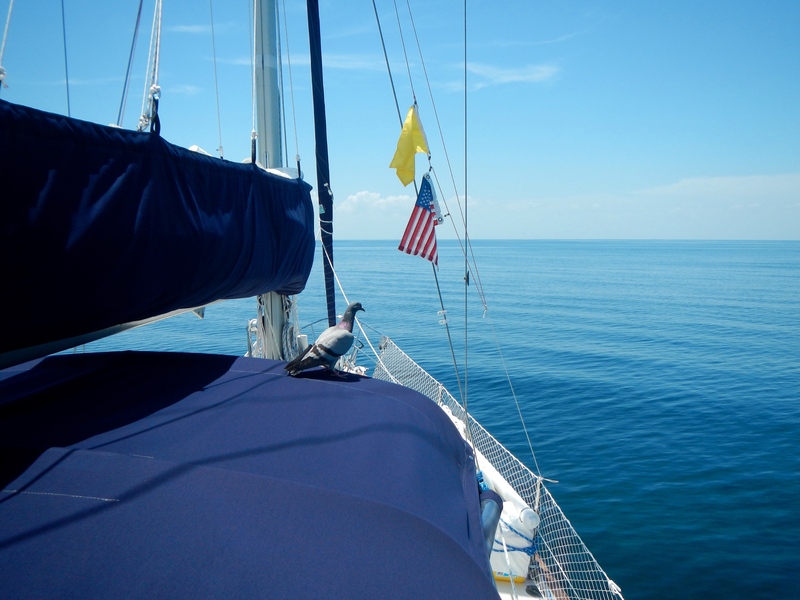 I’m not sure where we picked up a little pigeon but Kai didn’t even notice him until we were just off the coast of Florida. We pulled up to the Fort Pierce inlet around 430pm and hit the peak outgoing tide. It took us a full hour just to get through inlet, at some points we were doing less than a knot! Whew, that’s a current! 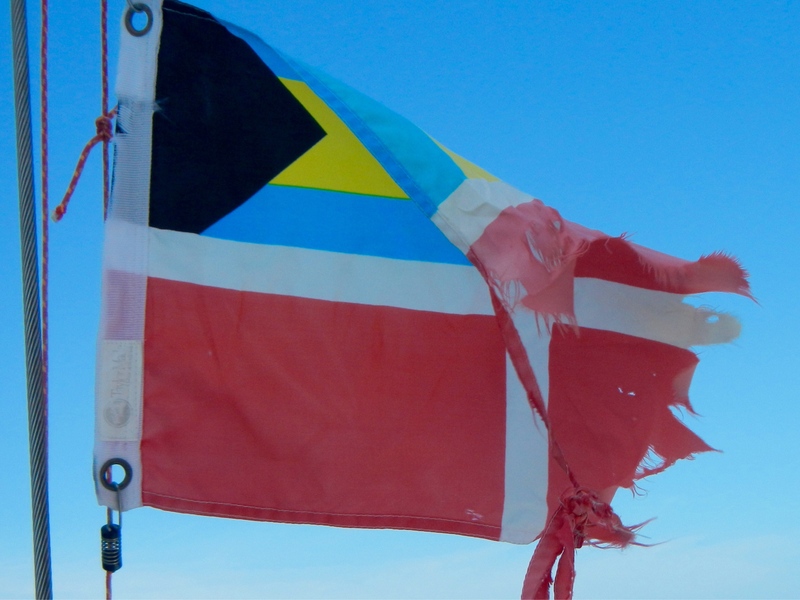 We took down our poor shredded Bahama flag and hoisted our Q flag. Don’t worry we already have a new Bahama flag ready to go, it will be flying again soon! Oh, we finally played with the radar. We like radar! We saw the squall, how big it was and where it was going. Neat-O! 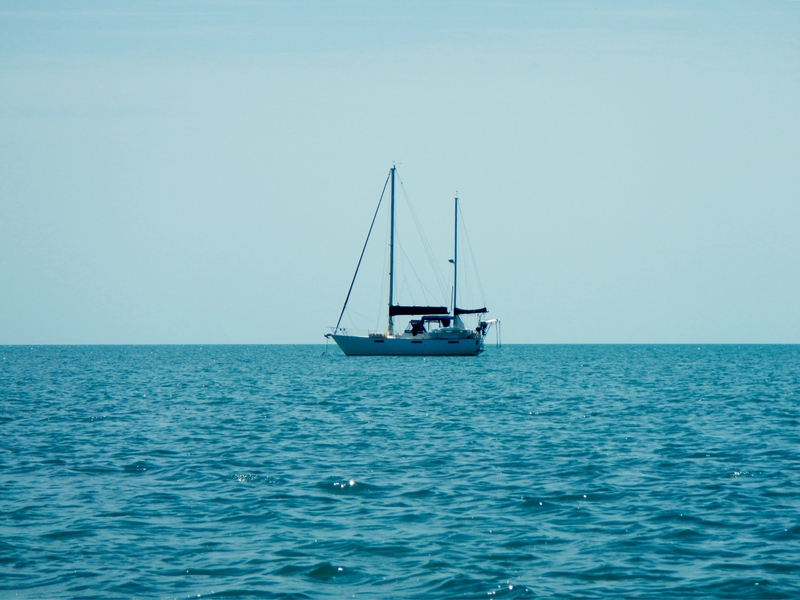 We could pick up all the little fishing boats and everything else that doesn’t have AIS. Too bad it broke only a few hours after we figured it out. Oh, well. We added it to the growing list of things to get done while we are here in Florida. So what did we do as soon as we got back to Florida? Uh, besides fall asleep and clear in. We went to 7-11. We’ve been twice today, actually. Old habits come right back, we used to be regulars at 7-11. Sadly, I guess we still are. We bought a $4.99 phone and two Big Gulps on the first trip. We bought a case of Diet Coke and Yuengling beer on our second trip. Internet and drinks, the two things we missed. That was kind of embarrassing to type. ^^ …and we are off! Keith and Kai on watch. ^^the past few weeks have been a bit windy! ^^our Bahama pigeon is now a Florida pigeon. We are pigeon traffickers. I don’t believe you- That CANNOT be the Gulf Stream!! Glad you are back, I have enjoyed your adventures. I would say welcome home but,”Home” is where your heart is! Fair Winds S/V Lunacy The Guy from Arkansas. Ellen, yes…….but I think I like clear water more than Diet Coke! Now, just to stock up and head back and I will have the best of both! After this pesky hurricane and rudder thing is over of course. :). And just because I know you know……Florida is FREAKN hot without an AC!!! OMG sweaty.